Steamburg hits a metaphorical iceberg and sinks. A lot. 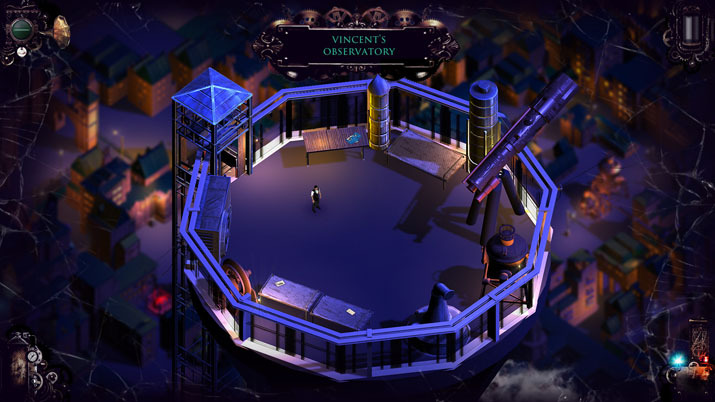 Steamburg, which was developed by Telehorse and published by Microïds Indie, has a great premise: Solve puzzles to destroy killer robots in a steampunk world. What is not great is the implementation of this premise. Poor decisions in design have sapped the life out of what could have been fun to play, making it hard to appreciate the few things that were done right. The most pressing problem is that I lost count of how many times Steamburg crashed for me, and I didn't play for much more than three hours — in large part for that reason. It’s simply not ready for release. The levels consist of navigating your character around a single screen, with the objective of luring all the killer robots to their destruction. The level will not end until you do so — and even if you do manage it, you must also gather all the energy balls to get a perfect score. So far, so good. The problems arise with the fiddliness of moving your character and executing actions. I despise the click-and-drag mechanism for throwing bombs, which you have to do for nearly every puzzle. The character can spin in place to turn the direction of the throw, but this happens so easily without you intending it that it makes it an exercise in frustration. You must be very, very exact and take your time aiming, or else your throw will end up somewhere you did not intend. Even when you’re careful, you find yourself spending a lot of time cancelling a throw, repositioning yourself, and then attempting the throw again. It feels incredibly unstable, which is a real problem when this is what you spend the majority of your time doing. I often had to redo levels over and over because of mechanical mistakes like these, which made the title tedious very fast. Instead of testing my puzzle-solving skills, each level only seemed to be testing my patience. Sounds… exciting? No. Fun? No. Familiar? Yes — annoyingly so. Maybe the idea to have airships, clouds, and hot air balloons float over the puzzle field seemed like a good idea in the sense of adding visual interest. Truly, Steamburg does sorely need some more visual interest, as the scene doesn't vary apart from these additions. But this solution is so, so annoying. You cannot predict when these objects will obscure your vision of the ground below, yet solving the puzzle requires time-sensitive reactions. This mixes very poorly. You must sit and wait for the object to pass by until you can continue, or else you just continue blindly and hope you don't die. The sound effects are reused without any variation, occurring frequently. I found myself cringing to hear the same thing so often. It is excusable for sounds that realistically would sound the same all the time, such as footsteps, but it is unnatural to make the same exact sound every time you die, or to have the identical sound of static on your radio between every utterance. 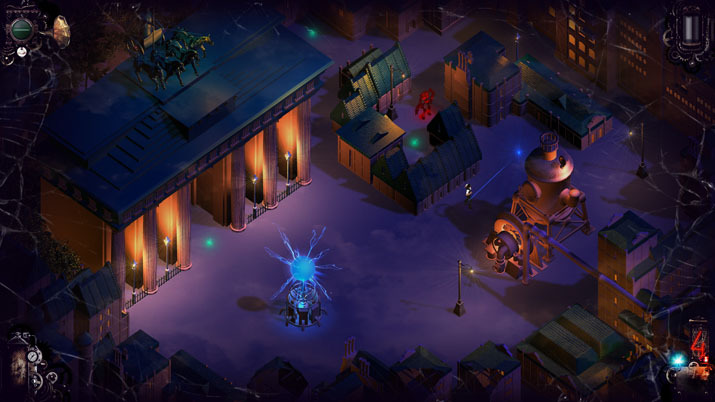 The narrative we're given is that a smart professor dude (you) has figured out how to save the city of Steamburg from the robots that are killing everyone. You alone are brave and smart enough to face the danger, apparently, although why couldn't you just tell everyone what to do so they could help? I guess there isn't time, or something. It's not explained. Anyways, you also have to save the love of your life. A damsel in distress, of course. I guess you're supposed to care, but I found that I couldn't.